I’m running into a growing number of colleges that have abandoned traditional search mailings. Also, more colleges are opting to keep their reps at home, rather than sending them on the road during travel season. Why? The new age we’re in: stealth inquiries and cost-cutting. In recruiting years past, enrollment managers often had a sense of how committed their applicant pool was to their institution by the time the bulk of the applications had been submitted. They’d already had multiple points of contact with large numbers of prospective students between inquiry generation and application. There were opportunities to begin building bonds early in the cycle. Yields were predictable. 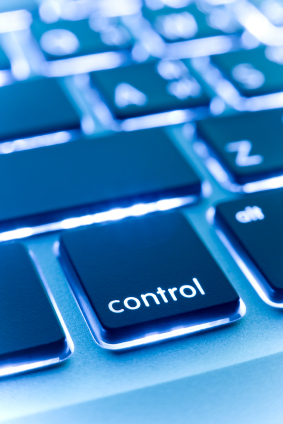 Measuring applicant pool commitment remains critically important because, as with anything in the business of enrollment management, measurement is the basis of control. Several years ago, Longmire and Company introduced the Applicant Commitment Index (ACI) – a number between one and four – that reflects how strongly a pool is devoted to an institution. The ACI score has proven to be instructive from two viewpoints: looking back and looking ahead. Looking back, a high ACI score (bad) suggests that an institution’s marketing, brand or product is not strong enough to win the level of commitment students require to enroll. Looking ahead, a low ACI score (good) suggests that a high percentage of applicants have cemented their decision and enrollment is very likely. An ACI score is predictive of yield and enrollment – something that is very reassuring and helpful in this age of uncertainty. Data that feeds the ACI comes from the students in the applicant pool. As part of Longmire and Company’s Yield Enhancement System program, over 100 data points are captured that influence the student’s college selection decision. Obtaining this information directly from students enables the calculation of the ACI but, more importantly, provides micro-level, real-time information about a student’s individual needs and preferences. With that information, a college can better match its communication (personal, print and electronic) and content to strengthen the student’s commitment. That’s the management after the measurement. 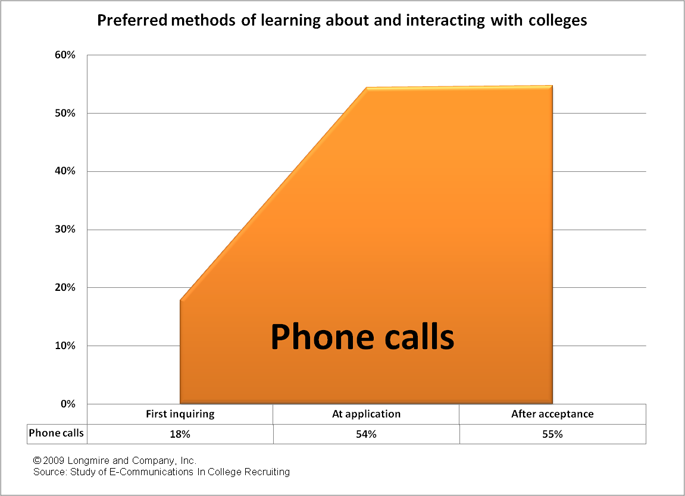 Successful recruiters know that developing a connection with a student can greatly increase their commitment to the college and improve the likelihood of enrollment. It’s clear from a recent Longmire and Company co-sponsored study that students will provide access to that connection. 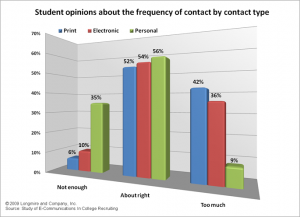 In the study, we found that 35% of the students said they don’t receive enough personal contact from colleges (see top chart). 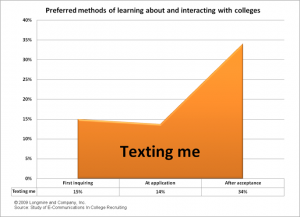 In addition, as the recruiting cycle progressed, a higher percentage of students favored getting more telephone calls from colleges, even after having been accepted (middle chart) and, after acceptance, over one-third of students wanted to receive more text messages. This and other data collected in the study suggest how important it is for an institution to deliver sustained and quality contact to the student after application. I can’t emphasize the word “quality” enough. Our quantitative and qualitative research over the last three years has revealed a growing demand by students that the information they receive after application is personalized and highly relevant to their needs. This is true whether they are stealth or not. October, also known as ” The Official Month for Campus Visits,” is upon us. If you are in the admissions biz you watch the Weather Channel 24/7 and pray that no rain, snow, sleet or other weather anomaly will dampen the academic, athletic and social activities you have worked so hard to prepare. Encourage the students to tour the dorms, maybe even notice the recycle bins on each floor and picture their own posters on the walls of the rooms. But, also remind them to visualize their graduation day – the student in cap and gown, surrounded by people he doesn’t know yet but will soon be his best friends for life – with his family proudly watching as he receives his hard earned diploma. You might ask if they followed their nose to the homemade cinnamon rolls they just ate for breakfast. Are you also tantalizing them with the sweet smell of success by having representatives from the alumni board (both young grads and older alumni) available for family interaction? As the sidewalks get crowded, is warm apple cider being sipped or soft drinks being served? Are your student tour guides whetting the appetites of the group with their own personal insights to campus activities? Is the decibel level of the cheerleaders practicing loud enough? Are your faculty members exciting their charges with intriguing anecdotes about former students who are now professional success stories? Are these prospective students being included in the magic that is YOUR college? Perhaps they are getting high fives from the team captains after the big victory, or a personal welcome and hand shake from the college president. Are you making them part of YOUR team? As the family drives away and the mental summary of the visit occurs, is that sixth sense of fit and comfort been reached? We have found that the most successful colleges are constantly evaluating their campus visit programs and are implementing extensive training programs that include every student touch-point. If you don’t already have a comprehensive evaluation of your program that includes input from prospective students and their parents you may be missing the mark. And, if your student ambassadors, financial aid team and faculty representatives haven’t been specifically trained in how to make their prospect contacts a winning one, they probably aren’t. This training and evaluation doesn’t have to be costly but it needs to be relevant, interactive and consistent. 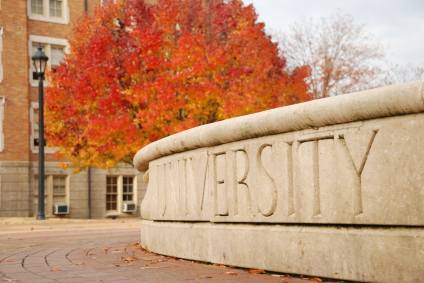 Here’s hoping November, “The Official Month for Applying to College,” will be a very busy one for you.